The West London Line is a relatively short stretch of railway (just over 6 miles in length) that provides a crucial north - south link between 2 of London's busiest Junctions, Clapham in the south and Willesden in the northwest. Approximately halfway along the line it passes through what must be one of London's most fascinating railway stations (and top photographic locations), Kensington (Olympia). The line runs through a densely populated area but currently serves only 2 passenger stations along the way (both providing interchange facilities with other lines). The line is double track throughout. The WLL was formed during the 1860s as a joint venture between the West London Joint Railway (GWR &LNWR) and the West London Extension Joint Railway (GWR, LNWR, LBSCR & LSWR). Whatever else it may be, the West London Line is, first and foremost, a high intensity cross London freight corridor linking together the multiplicity of routes that converge around its 2 major nodes to the north and south of the capital. In recent years, following railway privatisation and the creation of Transport for London, the WLL has seen increasing usage as a passenger route, with local, medium range and long distance services currently using the line. Local services are provided by Silverlink Trains, operating half-hourly (every 20 minutes at peak times) between Clapham and Willesden Junctions, using the same class 313 units they run on the North London Line. At Willesden High Level station there is same-platform interchange between WLL and NLL services. With regard to long distance services, this honour falls to Virgin Trains who operate a service between Manchester Piccadilly and Brighton. This train which, runs via Oxford, Reading and along the GWR main line, almost becomes a temporary freight lines rail tour in reaching the West London Line after negotiating several otherwise ?freight-only? links en route between Acton Wells, West London and Mitre Bridge Junctions. This service also has a scheduled WLL stop at Kensington (Olympia). Finally there is the service that doesn't run over the West London Line at all but which nonetheless provides a further key to its overall revival in terms of passenger operations, namely the LUL District Line. Trains on the District Line operate from a bay on the southwest side of Kensington (Olympia) station providing a frequent service on the 4 minute journey to and from Earls Court and, thereafter, the London Underground system as a whole. Kensington (Olympia) itself lies approximately halfway along the WLL and is a station worthy of special mention. It stands to the north of the road bridge that crosses the WLL at the western end of Kensington High Street. The railway itself forms the boundary between two London boroughs with the result that the southbound platform is located in the borough of Kensington & Chelsea and the northbound in Hammersmith & Fulham. Originally named 'Kensington' the station was opened by the Hammersmith & City (later Metropolitan) Railway in 1864 (a month after the H&C had opened its line from Paddington to Hammersmith). The link from the H&C to the WLL was made by installing an east/south link from the H&C's Paddington- Hammersmith line at Latimer Road to join the WLL north of Kensington with an intermediate station (opened the following year) at Uxbridge Road. Following the subsequent expansion of lines and stations in the area Kensington was renamed Kensington (Addison Road) in 1868. In 1867 it became the terminus of the so - called 'Outer Circle', a route that ran over the present North London Line from Broad Street via Willesden Junction then onto the West London Line to Addison Road. From 1869 the service was extended all the way down the WLL then over the LBSCR to Victoria Mainline station. In 1873 it was rerouted to run from Addison Road to Mansion House over the current District Line and, from 1908, the destination was changed once again, this time with trains terminating at Earl?s Court. By 1912 the operation had been reduced to a Willesden Junction - Earls Court shuttle, before the service was finally withdrawn in 1940. During the same period Kensington (Addison Road) also became part of what came to be known as the 'Middle Circle', a line opened in 1872. In its heyday the 'Middle Circle' ran from Aldgate around to Baker Street, Paddington and Ladbroke Grove before turning south over the link from Latimer Road to Kensington (Addison road) then east along the present District Line to Mansion House. By 1910 this had been cut back to a shuttle service between Edgware Road and Addison Road. This service was also finally withdrawn in 1940 and the H&C 1864 link from Latimer Road closed. Yet another line from Kensington (Addison Road) provided services to Richmond and the southwest. Opened in 1869, this was constructed by the LSWR and left the current WLL a short distance north of the station, turned west over the H&C line, headed south to a station at Hammersmith, Grove Road (just west of the existing H&C terminus at Hammersmith Broadway) before joining the existing westbound District Line near Ravenscourt Park. (This line closed as long ago as 1916). Kensington (Addison Road) was renamed Kensington (Olympia) in 1946, the same year the present District Line service to Earl?s Court was introduced. Back in the 1960s and 70s things were somewhat different on the passenger front. 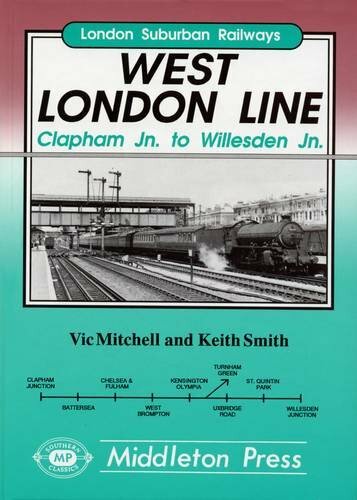 The only WLL passenger service operating at that time was unadvertised, running (as I recall) 2 trains during the morning and evening peaks between Olympia and Clapham Junction for the benefit of Post Office workers. This was in fact one of the last BR steam ? hauled trains I ever saw with Standard class 4s regularly in charge up until the closure of Nine Elms shed in 1967. As for the District Line, this operated in those days as a restricted shuttle service between High Street Kensington and Kensington (Olympia) via Earl?s Court, running only during those periods when major events were taking place at the Olympia Exhibition Centre. This was fine for visitors and tourists but, from the point of view of the regular season - ticket holding commuter, totally useless. One of Olympia's main activities at that time (other than the cross-London freights) involved a service that had grown steadily in popularity following the introduction of Europe's first experimental car/sleeper service between Lodon (Holloway) and Perth in 1955. This service became known as the 'Anglo Scottish Car Carrier' with an overnight Car-Sleeper service also operating. These became part of the BR Motorail service officially launched in the mid 60s. Motorail also ran to Edinburgh and Stirling for a time but the gradual reduction in usage during the 1970s and 1980s (due to the growth in foreign holiday package travel) saw services gradually withdrawn. Nowadays the only such service in the UK is operated by First Great Western between London and Penzance during the summer timetable as part of its 'Night Riviera' sleeper. New traffic through Kensington Olympia in recent years includes 'Eurostar' trains, with a considerable number of comings and goings daily between Waterloo and North Pole depot (via West London and North Pole Junctions). This traffic will of course cease once the new Channel Tunnel route from St Pancras opens with trains being handled at a new Eurostar depot at Stratford. As to the future, following the new WLL station, which opened alongside the existing District Line station at West Brompton in 1999, and which has proved extremely successful, further stations are now planned at Shepherd's Bush, (providing an interchange with the Central Line) and Imperial Wharf (also referred to as Chelsea Harbour), which will serve the large riverside development in that area. Strangely enough, the planned WLL station at Shepherds Bush will be on the site of the old and long demolished Uxbridge Road station just south of the H&C's 'Middle and Outer Circle' link from Latimer Road to the WLL which started everything off back in 1864! The new West London Line stations are scheduled to open during 2006 and will be a further landmark in the ongoing development of this key route for the benefit of both passengers and freight.